Successfully Added Elephone EleCam Explorer Elite 4K Action Camera - Sony IMX 078 CMOS Sensor, 170 Degree Lens, IP68, NTK96660 Chipset (Silver) to your Shopping Cart. 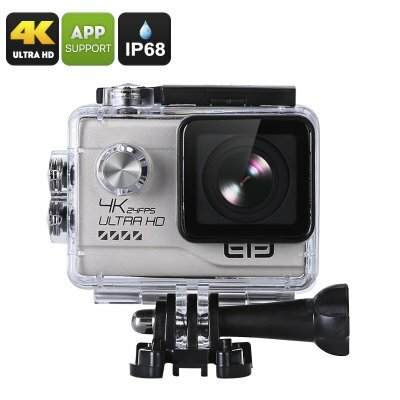 Record all your adventures in stunning 4K resolution. With its ultra high definition the Elephone EleCam Explorer Elite action camera allows you to capture and share all your favorite memories in a detail never experienced before. Whether you are skiing, mountain climbing, diving, or parachute jumping, the Elephone ELECam Explorer Elite is the perfect action camera to bring along to ensure that not a single moment of fun gets forgotten. Whether its 20MP pictures or 4K video, you can be sure of a great result thanks to the camera’s Sony IMX 078 CMOS Sensor. Its state of the art chipset enables you to conveniently record 4K ultra-clear footage and is capable of capturing high-speed motion scenes in extreme detail. Additionally its 20MP camera lets you capture stunning pictures even in low light. Thanks to its night scene you will be bale to capture mesmerizing footage and pictures during both day and night. With its IP68 rated waterproof case the Elephone EleCam Explorer Elite action camera is capable of functioning perfectly in any weather condition. Humidity, rain, snow, and ice – nothing will stop this camera from operating. Being capable of functioning up to 30m under water this sports camera makes the perfect companion for all your surfing, scuba, and diving trips. Featuring anti-shake modus the Elephone EleCam Explorer Elite guarantees to deliver high quality and clear footage at any given moment. Whether it’s at day or night, while cycling in the mountains or diving in the sea – the 4K footage captured with this action camera will keep on amazing you every time again. Holding a 1050mAh battery this action camera provides you with up to 1.5 hours of non-stop shooting, enough time to capture all the special moments within a day worth of adventures without the fear of running out of juice. Wi-Fi connectivity furthermore enhances your user experience and allows you to easily transmit files from the Elephone EleCam Explorer Elite to your tablet, smartphone, or PC. Featuring a 170 degree wide angle lens this action camera provides you with an excellent shooting vision to capture all the unforgettable moments in life.